Welcome to Pinstripe Investigations, Inc. a Melbourne Florida private investigator agency providing investigation services to the entire state. We are a full service investigations agency offering all prospective clients a free consultation to discuss the benefits of our services. Our consultation process helps our clients understand the type of surveillance needed, the time, and the budget needed for satisfactory results. We work with our clients to find the most cost effective solution that will obtain the best results. All of our investigations are conducted with our client's interests in mind. Our Melbourne private investigators are available 24/7 and on short notice. You can rest assure that our investigators will be able to provide you with the information necessary to give you peace of mind. As the premier Melbourne Private Investigative agency, Pinstripe Investigations, Inc. has earned a reputation as the Melbourne Florida Private Investigative agency with the highest quality in customer service and satisfaction. With over 30 years of experience, Pinstripe Investigations has been providing first class investigation and surveillance services to the entire state of Florida from its Melbourne FL offices. Our investigators work closely with criminal case attorneys to understand their litigation strategy to help build an effective legal case and take actions to substantiate their case or lawsuit. 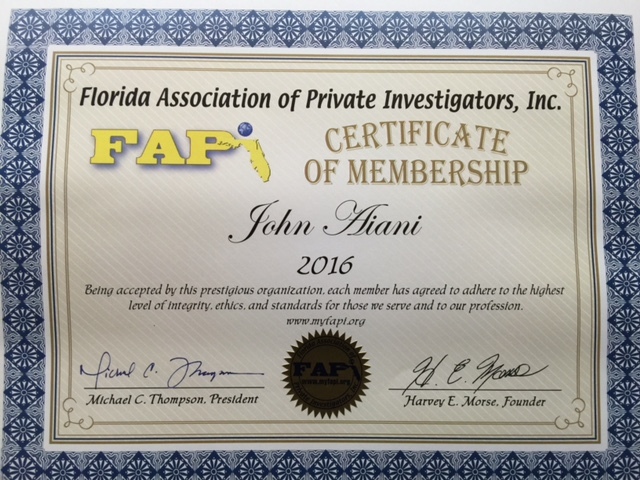 Our investigators are also Certified Ballistics & Latent Print Experts. As a certified process servers, Pinstripe Investigations, inc. is available 24/7 for your civil process serving needs within the 18th Judicial Circuit in Brevard and Seminole counties. Pinstripe Investigations offers comprehensive background checks at an affordable cost. From pre-employment, to criminal background checks. Our checks go beyond a simple database profile.